The beautiful Taragarh Fort is one of the oldest forts in the world. It is located at a distance of 39 km from Kota, Rajasthan. Once the abode of the royal Rajput family, it is now a great attraction for tourists. It was built in 1354 by Ajaipal Chauhan, the founder of the city and can be reached through the steep road leading to its main entrance. You will be received at the main gateway by two huge marble elephants. There are two more gateways to the fort. The towering gateways of the fort are almost in ruins. 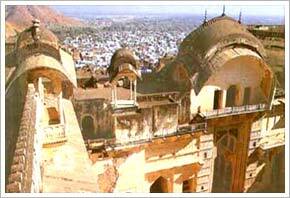 Taragarh Fort is also called the Star Fort. The fort houses a huge battlement named Bhim Burj which was constructed in the 16th century. It served as a home to huge cannon called Garbh Gunjam or Thunder from the Womb. It is the second largest cannon in India. The complex of the Taragarh Fort has some massive water reservoirs. The purpose of the construction of these water reservoirs was to store water which could be wisely utilized during a water crisis. Make sure you pay a visit to the beautiful Rani Mahal within the complex of the fort. This Mahal was especially made for the royal ladies of the regal family. The fort also has a Dargah called Miran Saheb Ki Dargah where people still come to pay homage to the brave and loyal warrior Miren Saheb who gave his life while defending the fort during a battle.